Members of Hamilton’s Advisory Committee for Persons with Disabilities have been skeptical about the Hamilton Light Rail Transit Project – much of their concerns related to the lack of HSR planning for LRT, and the lack of communication from HSR management on what local service will look like once the LRT is implemented. 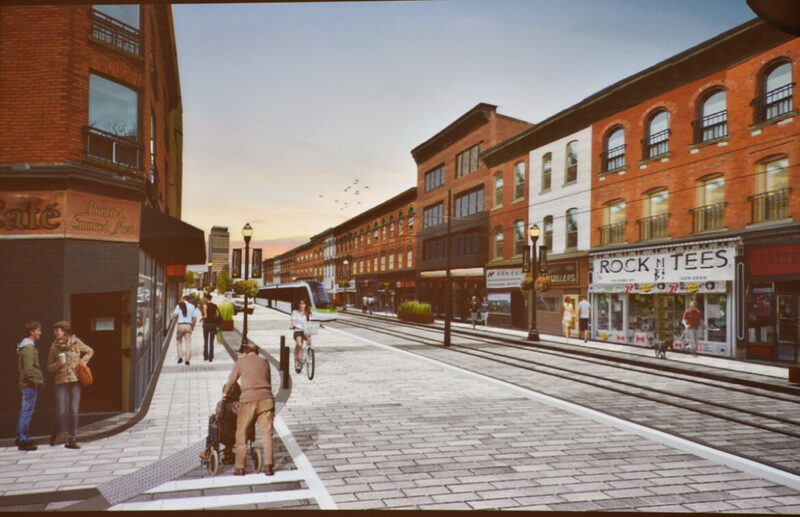 The City’s LRT office and Metrolinx attended Tuesday’s ACPD meeting to discuss the Streetscape Design Strategy, with a focus on how pedestrian sidewalks will be designed. LRT project staff focused their presentation on the International Village “Pedestrian Priority Zone”. Staff proposed using Unipaving stones with different textures in place of urban braille. Nolan says in a recent trip to Ottawa, they went to the new sidewalks along Ottawa’s LRT and he saw no urban braille features at stops. “I would strongly encourage not to follow the Ottawa model”. “Regarding urban braille, it is something the City is pushing for along the entire corridor,” said Trevor Horzelenberg, Senior Project Manager in the LRT office. “Please note that urban braille costs at least double the amount of a normal sidewalk … it is an additional cost to the project”. Horzelenberg says the City is pushing for Metrolinx to implement urban braille along the entire route. Other members also said that any colours on the sidewalk, street planters, and other amenities need to have strong contrast, and nothing along the clearway of the urban braille. The LRT office will return to the ACPD again during the design phase.